The relations between mobilities and health have been considered to be a central feature of today’s global society (Gatrell, 2011). Too much movement has often been attributed to various illnesses including bodily disruptions such as seasickness and jet-lag as well as mental ill-health such as homesickness, phobias. However, travel is also seen as being ‘good for the soul’, part of quasi-spiritual quests to become more healthy in mind and body. Such human mobilities require healthy environments which are sustainable and resilient. Healthy mobilities need to be major goals for policies aiming at sustainable and liveable cities and environments. In the context, the School of Tourism Management at Sun Yat-sen University will be hosting the International Conference of Mobilities, Health, Wellbeing and Tourism. The conference will invite scholars studying mobilities, health, wellbeing and tourism from universities in Asia, Europe and North America to share new ideas, new approaches and new trends in mobilities and health research. The issues on the relationship between different types of mobilities and health as well as its research status, development trends, opportunities and challenges will be discussed; and it is hoped that through this exchange platform, a good academic sharing and cooperation could be established, and a large number of young scholars will be trained and brought up to promote China’s tourism research to the world level. Regular registration: payment after 30 September, 240 Euro (for regular participants)/130 Euro (for graduate students). Participants need to cover travel and accommodation expenses by themselves. In order to ensure that the participants get the invoice of the registration fee as soon as possible, after you remit the registration fee, please send an e-mail to this E-mail address（mobilities_health@163.com） and the mail subject should be marked ‘mobilities and health International Symposium + name + Invoice title’ for our verification. Participants are required to remit the registration fee to the following account, and mark ‘mobilities and health International Symposium + name’ when remitting. After you remit the registration fee, please let us know by sending an e-mail (mobilities_health@163.com) and the mail subject should be marked ‘mobilities and health International Symposium + name + Remittance’. Lancaster University is celebrating the life of the eminent Sociologist, Distinguished Professor John Urry with a inaugural John Urry Memorial Lecture. Professor of Sociology Saskia Sassen, Columbia University, will be the special speaker. Cost: This event is free and tickets can be booked here. You can also email us at public-events@lancaster.ac.uk or call 01524 592994 to book. The accumulation of knowledge, data and scholarship across past decades has been a substantial enabler for social scientists, whether working on immigration, the family, inequality, political power, or many other social science fields. Yet every now and then, social scientists are confronted with emergent conditions which are not well captured by existing models and measures. 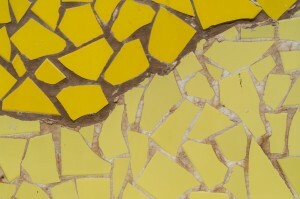 In this inaugural John Urry Memorial Lecture, Professor Saskia Sassen explores the search for a mix of categories which have enabled her to capture and conceptualise conditions that cut across established categories, finding configurations that lack a recognised formal ‘home’ – an established specialised sub-discipline. Professor Sassen will also cite how leading international and Lancaster University sociologist, the late Professor John Urry, stimulated a major contribution to the range of sub-disciplines through his wide-ranging work and opened up the field for new generations of researchers to ask new types of questions. Saskia Sassen is the Robert S. Lynd Professor of Sociology and a Member of The Committee on Global Thought, Columbia University (www.saskiasassen.com). Her latest book is Expulsions: Brutality and Complexity in the Global Economy (Harvard University Press 2014), now out in 18 languages. She is the recipient of diverse awards, including multiple doctor honoris causa and the Principe de Asturias 2013 Prize in the Social Sciences, and was made a Foreign Member of the Royal Academy of the Sciences of Netherland. 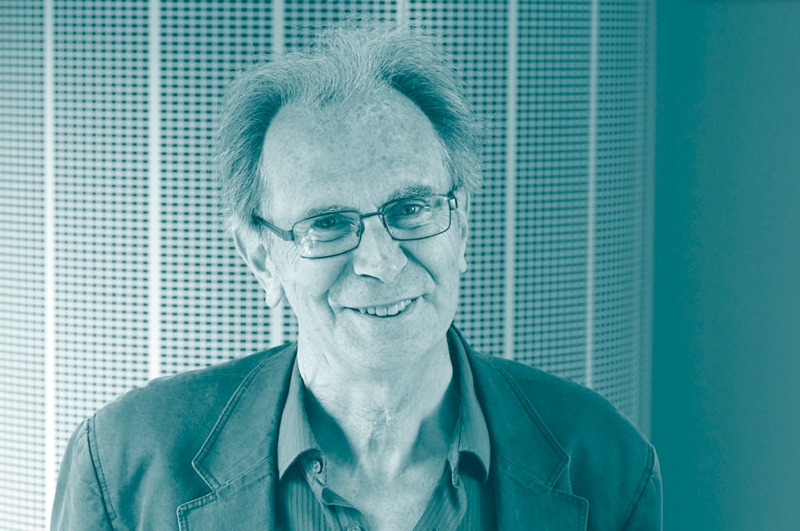 John Urry was an influential scholar who has shaped several fields of sociology. He died suddenly on 18 March 2016. The John Urry memorial lecture is held in his memory to generate and debate the big ideas in society. Professor Urry was a former Head of the Scoiology Department at Lancaster University, Dean of the Faculty of Social Sciences and University Dean of Research. From 2003 to 2015 he was Director of the Centre for Mobilities Research and helped to develop the ‘new mobilities paradigm’ in social science research. John guided the development of the Sociology Department at Lancaster University as well as the direction of research in the wider community of Sociology, and made a significant contribution to the establishment of the Academy of Social Sciences. With a global intellectual presence and international recognition as a public intellectual, he pursued ideas and engagement for social justice through collegiality and collaboration. 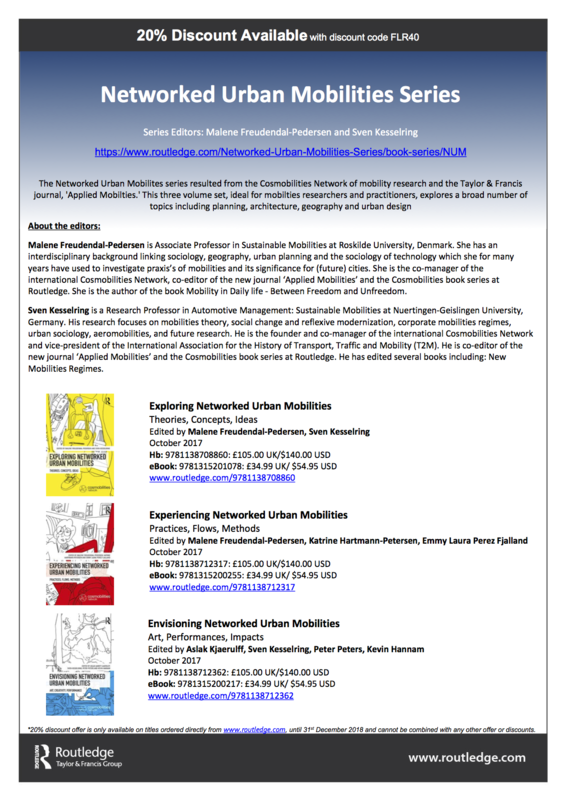 We are happy and proud to announce the NETWORKED URBAN MOBILITIES trilogy published by Routledge International. The covers of the three books have been originally developed and designed by Michael Hieslmair and Michael Zinganel. In 2014, we celebrated the 10th birthday of the Cosmobilities Network with a conference and exhibition in Copenhagen. This 3-part book series is based on that event. During the past three years, more than 50 authors and contributors have helped us develop their work presented in Copenhagen into this unique and exciting publication. Amongst the contributors are the late John Urry and the late Ulrich Beck, Monika Büscher, Mimi Sheller, Vincent Kaufmann, Steve Graham, Christian Licoppe, and many others. The first volume contains grounding theoretical and conceptual texts from some of the key figures in the mobilities research field. As a starting point for the series, the concept of ‘networked urban mobilities’ as globally expanding infrastructural spaces is presented, along with future research agendas arising from this. The second volume gives an overview to the broad fields of research mobilities scholars cover, today. With more than 30 chapters the volume includes both interdisciplinary methodological discussions, as well as reflections over the many types of empirical sites and flows, that mobilities researchers engage with. The third volume is based on the art exhibition during the conference in Copenhagen, curated by Aslak Aaamot Kjaerulff. The book brings together artistic and conceptual work from artists, historians and social scientist and deepens the work of the Cosmobilities Network on the analytical power of arts and social science in mobilities research. To purchase the books with discount follow this link. Paperback version of the books will be published within the next 18 months. This joint Cemore + T2M + Cosmobilities conference will bring together historians, researchers, artists, policy-makers, designers, and innovators to explore Mobile Utopia: pasts, presents, futures. The Centre for Mobilities Research (Cemore) at Lancaster University, the International Association for the History of Transport, Traffic and Mobility (T2M) and the Cosmobilities Network have joined together to invite contributions across the spectrum of mobile utopian themes. Recognising the global uncertainties of the Anthropocene, we invite reflections on utopia (and dystopia) that explore how societies shape, and have been shaped by, complex im|mobilities, from microbial to big data mobilities, from horse-drawn carriages to driverless cars, from migration to planetary jet streams. We invite proposals deploying utopia as a heuristic and creative methodology – rather than as a narrative closed system – which challenges our assumptions about what has been possible in the past and what will be possible and preferable in the future. We welcome reflections from any city, country or place, in relation to any theme, scale, or period in history. In addition, proposals may address any aspect of the history, and social, cultural, economic, technological, ecological and political aspects of the diverse dimensions of im|mobility. Proposals are encouraged to use a range of formats, academic, creative and otherwise, as outlined in the call for papers. We welcome contributions from any academic perspective or discipline, as well as contributions by artists, professionals, policy makers and practitioners. Recent entrants to the research field and doctoral students are especially welcome, with reduced rates and travel bursaries available in some cases. We look forward to welcoming you at the Centre for Mobilities Research at Lancaster University. 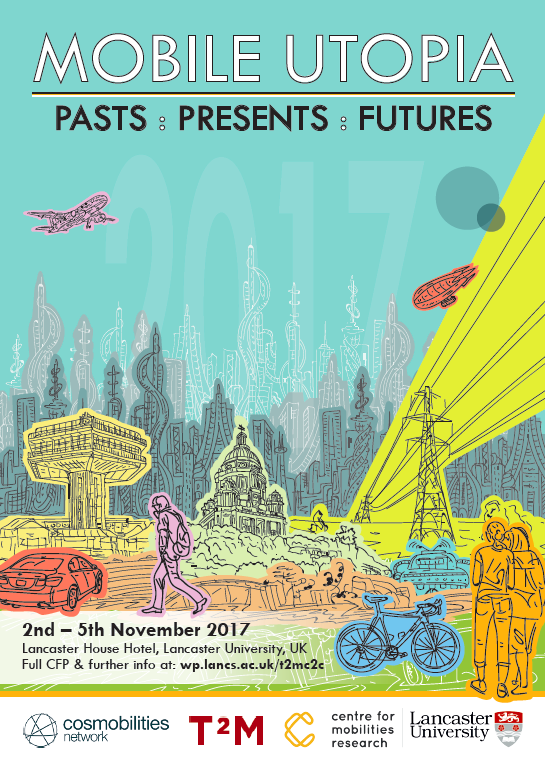 This joint conference brings together historians, researchers, artists, policy-makers, designers, and innovators to explore Mobile Utopia: Pasts, presents and futures. Lancaster’s Centre for Mobilities Research, the International Association for the History of Transport, Traffic and Mobility (T2M) and the Cosmobilities Network have joined together to invite contributions across the spectrum of mobile utopian themes. In addition, proposals may address any aspect of the history, and social, cultural, economic, technological, creative, ecological and political aspects of transport, traffic and mobility. Utopia is an integrative method that can assist us when thinking about the relationship between societies and mobilities past, present, and future. It can help us trace the complex interconnections between the urban and the rural, the digital, oceanic, global, and planetary, the here-and-now and the longue durée. Utopia creates rich ground for contestation, as one person’s utopia can be another’s dystopia, and innovative visions followed through produce unintended consequences. From the UN’s Sustainable Development Goals to visions of a future where CO2 emissions are no longer the norm, utopia helps us challenge the past and present by imagining the future.As research has shown, transformations in governance, everyday practices, and exchanges between communities are key to the success or failure of these visions. This call invites proposals exploring utopia as a heuristic and creative methodology – rather than as a narrative closed system – which challenges our assumptions about what has been possible in the past and what will be possible and preferable in the future. We invite reflections on the diverse dimensions of im|mobility adopting such a utopian perspective from any city, country or place, in relation to any theme, scale, or period in history. 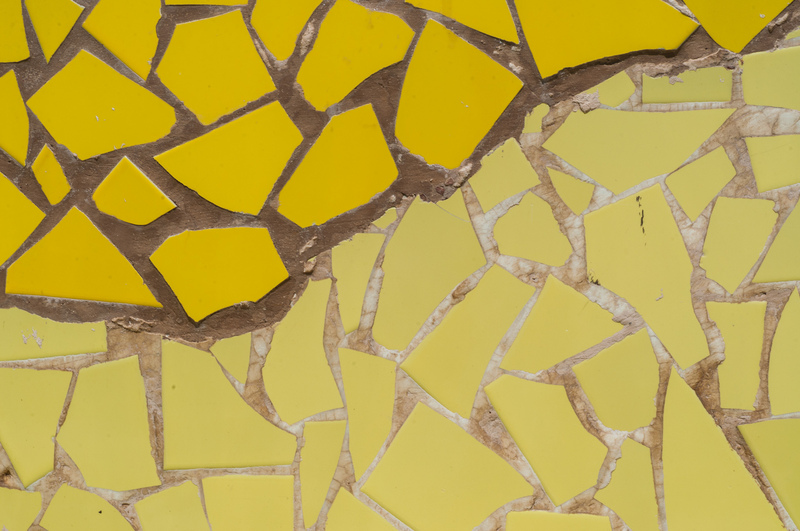 We encourage transnational, comparative, artistic, design-led, interdisciplinary and trans-modal approaches, and welcome proposals exploring theoretical or methodological issues as well as those of a more empirical nature. We invite different submission and presentation formats. Submission deadline is April 15th. Hope this give you a little bit more space to be creative. We can’t wait to receive your contributions!